Water quality indicators for Upper Lemon Bay showed a mixed message for 2015. After an improvement in chlorophyll a concentration in 2014, this water quality measure increased by over 21% in 2015, a worrisome sign. However, the mean concentration of both total nitrogen and total phosphorus improved somewhat, and dissolved oxygen levels were also slightly better. The higher chlorophyll a levels downgraded the rating for that water quality measure from “Good” back down to “Caution”, causing the overall rating for Upper Lemon Bay also to decrease to “Caution”. Water Quality: Chlorophyll a mean concentration in 2015 was of 0.0107 mg/l, exceeding the threshold of 0.0089 mg/l. Mean nitrogen concentration improved slightly, to 0.5948 mg/l, but was still slightly above the threshold of 0.540 mg/l. Mean phosophorus concentration also was slightly lower, and at 0.1297 mg/l is “Excellent”, roughly half the threshold concentration. The mean for chlorophyll a was calculated as an arithmetic mean and the means for nitrogen and phosphorus were calculated as geometric means (per the Numeric Nutrient Criteria outlined in the Florida Administrative Code, section 62-302.532). Biotic Indicator: Measurement of the biotic indicator, seagrass, was performed in 2014 by the Southwest Florida Water Management District. Between 2012 to 2014, seagrass coverage in Lemon Bay (including both the Upper and Lower segments) increased from 3,727 to 3,913 acres, exceeding the combined target value of 3,890 acres. 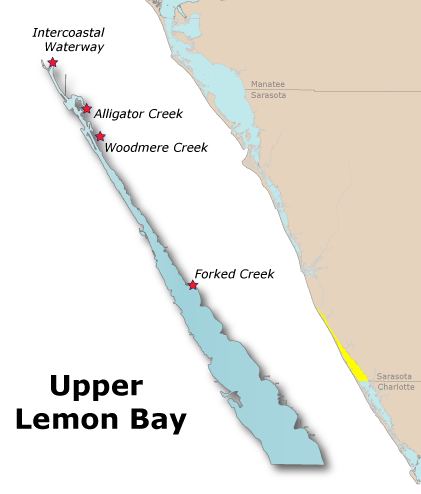 Upper Lemon Bay was not surveyed separately, but has a target level of 1,010 acres.